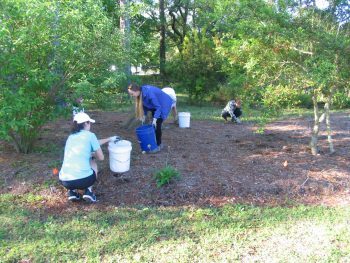 On April 30 the North Carolina Coastal Federation hosted 37 volunteers at the Bradley Creek Elementary School rain garden for Work on Wilmington, a communitywide event to promote partnerships and community service. During the event, volunteers worked in the rain garden mulching, weeding and performing overall maintenance. One group put on waders and removed cattails, as these can quickly become a dense monoculture from the stormwater wetland. Volunteers were able to clear a lot of dead vegetation and open up space for native species and habitat growth. Work on Wilmington is led and coordinated by the Wilmington Chamber of Commerce. Work on Wilmington works in partnership with community organizations and agencies to create meaningful, hands on service projects. Volunteers included N2 Publishing and the Blockade Runner Green Team. 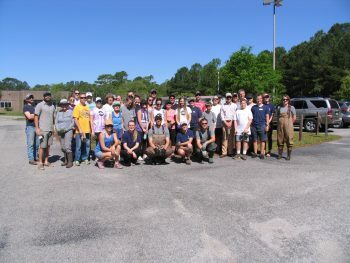 The Blockade Runner Beach Resort won a Pelican Award in 2017 for its business partnership, and its Green Team, which performs environmental waste audits and works to reduce the resort’s energy consumption, plastic pollution and more, consistently participates in the federation’s volunteer events. The federation is thankful for the support from New Hanover County Schools and Beach Bagels, both of which were event sponsors. Beach Bagels provided coffee and bagels for the volunteers. This rain garden is used as an outdoor classroom that allows students to learn about stormwater runoff and local water quality. Learn more about the federation’s school rain gardens.